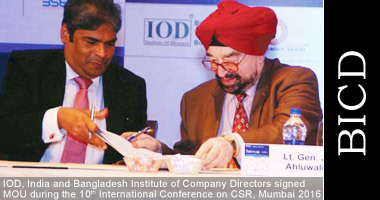 IOD, India was established on 12th July, 1990, as an independent, duly registered non-profit apex association of professional corporate directors. 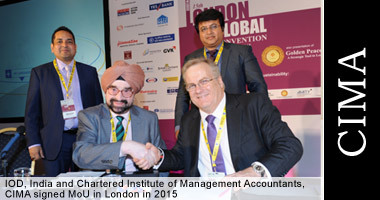 The directors are from organizations from public and private sectors and (government of India). IOD, India is the premier organization for development, training and networking of directors to attain their leadership role. 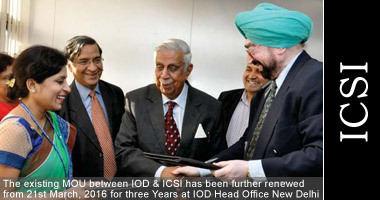 IOD, India aims at international cooperation on issues relating to boardroom practices, corporate governance, Quality, CSR, Sustainability and directorial responsibilities under the law. 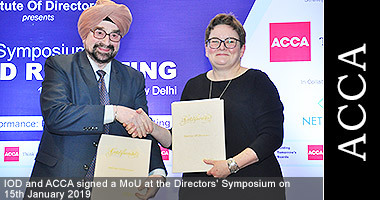 Institute Of Directors, India and following associate partner organisations wish to strengthen their cooperation and explore further collaborative opportunities to drive higher standards of transparency and integrity in business governance and reporting by corporations and organisations. 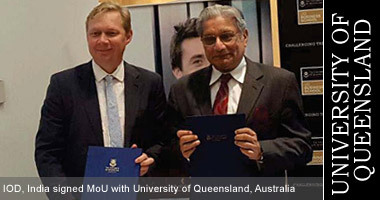 Thus it recognises that joint collaboration and efforts in exploring opportunities and establishing a cooperative relationship benefits both the Parties. 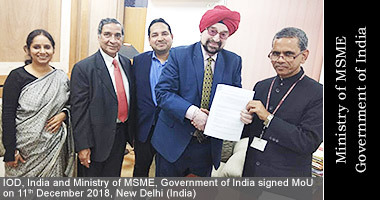 In a landmark collaboration on the 11th November, 2018, The Institute Of Directors joined hands with the Ministry of MSME, Government of India in forming a strategic alliance and working towards development of management and governance of the MSME sector’s professional competency needs through a portfolio of curated developmental initiatives. 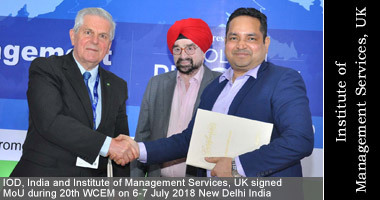 The MoU was signed by Lt. Gen. J.S.Ahluwalia, President, IOD & Mr. Ram Mohan Mishra, Additional secretary & Development Commissioner, Ministry of MSME, Government of India. IOD aims to contribute in the development of leadership and governance of the MSME sector, within the broad policy framework laid down by the Government of India. 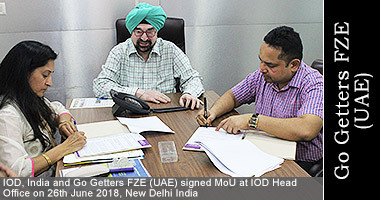 IOD has specially accepted the initiative to set up a dedicated division to focus on developing governance practices and skills for MSME sector. IOD realizes that its experience in building institutions and leadership and governance for over the last 27 years can be effectively dedicated to support the national effort in the development of MSME sector. IOD is launching this movement under the patronage and guidance of the Development Commissioner, Ministry of MSME. 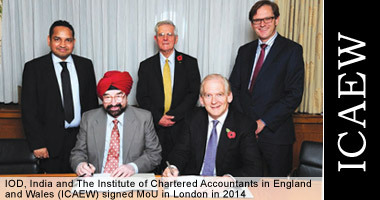 The MIoD was officially incorporated on 18 January 2008 as a not-for-profit company under the Companies Act 2001, but was already operating with an interim Board of Directors as from 16 July 2007. 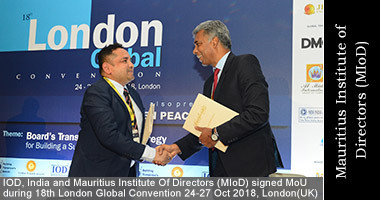 The project was to set up an Institute of Directors primarily to advance corporate governance in Mauritius by establishing a professional forum for directors and managers within the public and private sectors. It was entrusted to the National Committee on Corporate Governance (NCCG) which in 2006 commissioned 2 consultants, Anne Molyneux and Pierre Dinan, to develop a Business Plan. Pierre Dinan was subsequently approached by the NCCG to become an individual founder shareholder and a director of the Institute, and eventually became the first Chairman. From October 2007 to January 2008, the Interim Board met every month to deal with matters pertaining to the setting up of the Institute, ranging from the drawing up of the constitution to the proper title and designation of the new organisation. 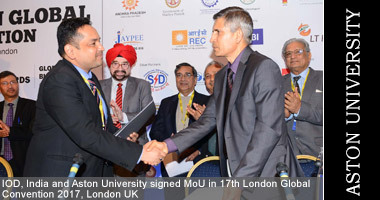 Aston University is a public research university situated at Gosta Green, in the city centre of Birmingham, England. Aston began as the Birmingham Municipal Technical School in 1895, evolving into the UK’s first College of Advanced Technology in 1956. Aston University received its royal charter from Queen Elizabeth II on 22 April 1966. In 2016, Aston was ranked in the top 33 universities in the UK by all three major league tables, and also received recognition Times Higher Education for the second best teaching quality in the UK. Aston was ranked by QS as the 42nd best university in the world under 50 years old in 2015. 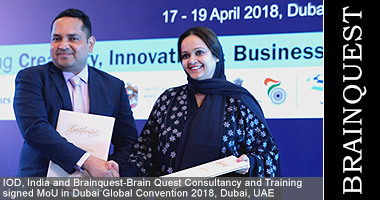 Brain Quest Consultancy and Training Brain Quest is state of the art Training and Consultancy firm. The training arm is designed to provide managers, leaders and business executives with the necessary skillset and knowledge that they may require to achieve the highest results in changing business environment. It provides training in the fields of Digital Transformation, Leadership, Strategy, Quality, Finance and Innovation. On the consultancy side, it provides value based solutions, assesses your requirement, understand your business objectives and design the solution accordingly. The Centre is a company limited by guarantee that endeavors to achieve high standards of corporate governance in corporations and institutions through training, education, research, advocacy, monitoring and evaluation. Dubai Quality Group is a non-profit organization set up by the Dubai Department of Economic Development under the patronage of H.H. Sheikh Ahmed bin Saeed Al Maktoum. Guided by the vision of H. H. Sheikh Mohammed bin Rashid Al Maktoum, Vice President and Prime Minister of the UAE and Ruler of Dubai, Dubai Quality Group was established in 1994 to develop and promote Quality and Business Excellences practices in UAE. Dubai Quality Group organizes mainly Quality and Business Excellence topics related training programs and events throughout the year with the objective of improving and promoting Quality of Service & Business Excellence in the Region. 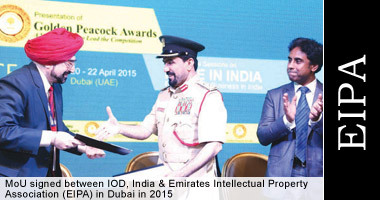 Emirates Intellectual Property Association (hereinafter referred to as “EIPA”), a national association of public welfare, whose aims are to spread the public awareness about IP crimes and provide law enforcement agencies and private sectors with the knowledge needed to combat IP crime. Established on 25th November 200 based in Dubai city, United Arab Emirates. Etisalat Academy is the UAE's leading telecommunications operator and one of the largest corporations in the GCC. As well as establishing several "firsts" over almost four decades of operations, Etisalat has deployed many innovative mobile and fixed technologies that have helped the UAE maintain its position as a leading global ICT economy. Headquartered in Abu Dhabi, UAE, as we serve almost 11 million customers in the UAE. To promote exports from India and to earn more foreign exchange for the country. To facilitate interaction between the EOUs/SEZs community and Government both at the Central and State level. To provide benefits of Market Access Initiative (MAI) Scheme rendered by the Central Government to Indian Exporters for assisting their export market development efforts. 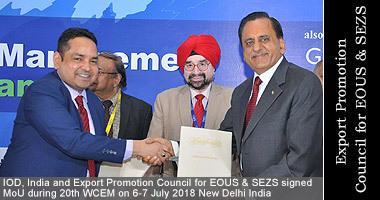 To collaborate with other export promotion councils/ export promotion organizations in India and similar bodies in foreign countries as well as with international organizations working in the field. IEMA transforming the world to sustainability. As the worldwide alliance of environment and sustainability professionals, we’re working to make our businesses and organisations future-proof. Through our global sustainability standards and partnerships, we are driving understanding and uptake of crucial skills that will keep the world of business in business. Discover more about our work and how to get involved. 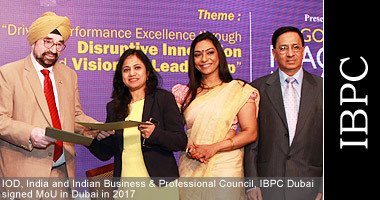 Indian Business and Professional Council, (IBPC) is the only recognised representative organisation of Indian Business and Professionals in Dubai. 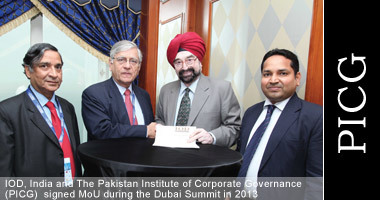 IBPC, Dubai was formed in the year 2003 after the unification of the three Indian business organisations in Dubai namely the Indian Business Council (IBC), Overseas Indians Economic Forum (OIEF) and Business & Professional Club (BPC). This new unified body was formed mainly to represent the Indian business and professional community in Dubai with all the activities of the three organizations conducted under the new banner. 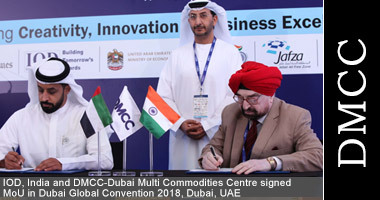 This formation of a single entity was in the larger interest of the Indian business community in Dubai to help better co-ordination of activities. An understanding of the concept of productivity and its improvement. The importance of structured approaches to productivity analysis, measurement and enhancement. To identify good practice and professional standards in productivity improvement by Individuals or organisations. To create and deliver education, training, advisory and support services aimed at helping individuals and organisations to establish and maintain that good practice and those professional standards. 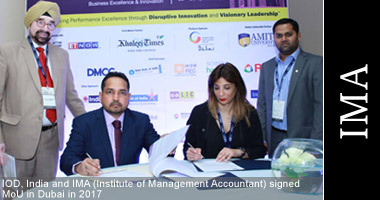 IMA (Institute of Management Accountants) is the worldwide association of accountants and financial professionals in business. Founded in 1919, we are one of the largest and most respected associations focused exclusively on advancing the management accounting profession. We are committed to empowering our 85,000+ members - and those throughout the rest of the profession - to strengthen on-the-job skills, better manage companies, and accelerate careers. We invite our members to discover the myriad possibilities within the profession and build an actionable future in management accounting. 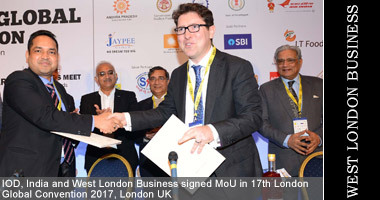 West London Business is a business-led non-profit established in 1994 with a board including blue-chip firms such as Heathrow and PwC, as well as Fullers, Brunel University London and micro enterprises. Our mission is to ensure that West London remains the best place to do business. West London is an amazing sub-region: it’s a £50bn economy and the second largest economic powerhouse in the UK. Our members commit to work together to raise West London’s global economic competitiveness, whilst pursuing social and environmental sustainability.